Found during search for George Ebenezer Knight, 53350. No relation. 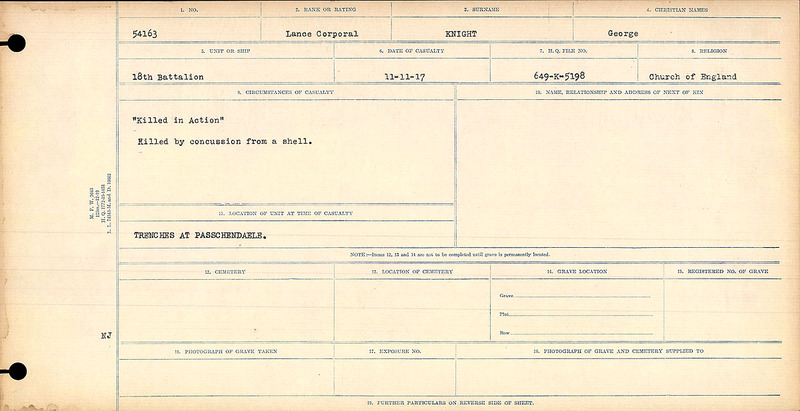 “Killed in Action” Killed by concussion from a shell. January 6, 1890 Born Born Birmingham, England to Mrs. Rose A. Knight. 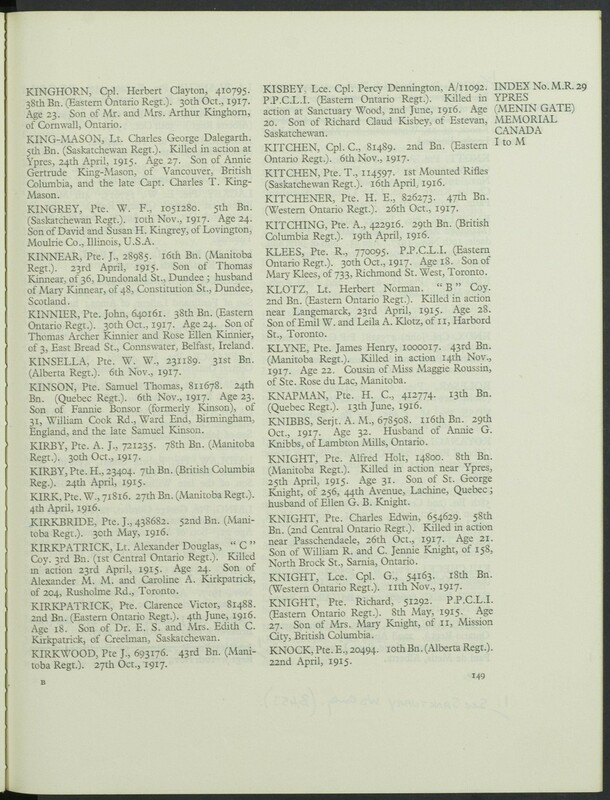 January 12, 1915 Enlisted Enlisted at London, Ontario with the 18th Battalion, C.E.F. with reg. no. 54163. His trade was fireman and he was taller than average for a recruit at 5’10”. He is assigned to “B” Company. May 1, 1915 Assigns Pay Assigns $10.00 per month to his mother, Mrs. Rose. A. Knight. June 15, 1916 Absent Without Leave Forfeits 1 day pay as A.W.L. August 17, 1915 Admitted to Moore Barracks Hospital Bronchitis. August 26, 1915 Transferred Transferred from 18th Battalion to 48th Reserve Battalion. Reason not known but perhaps due to expectation of a long recovery from bronchitis. October 24, 1915 Completes Will Private Knight assigns his estate to his mother. October 27, 1915 Canadian Base Depot Transferred from 48th Reserve Battalion to 18th Battalion. October 31, 1915 Proceeded to Join Unit In transit to the Front. November 3, 1915 Arrived at Front Unit in trenches at Vierstraat, Belgium. December 10, 1915 Admitted to Hospital S.M.H. High Beach. Bronchitis. March 10, 1916 Admitted No. 8 Stationary Hospital Wimereux, France. Pleurisy. March 15, 1916 Transferred No. 3 General Hospital Kettering, England. July 11, 1916 Transferred Transferred for “full duty” with the 39th Battalion at West Sandling, Kent, England. August 28, 1916 Transferred Transferred to Base Company. October 8, 1916 Transferred Taken on Strength with the 48th Battalion. November 9, 1916 Drafted Drafted to duty back with the 18th Battalion. November 10, 1916 Arrives Canadian Base Depot Arrives C.B.D. and taken on strength with the 18th Battalion. March 18, 1917 Arrives 18th Battalion Arrives at the 18th Battalion. It is located at Mont St. Eloy in Brigade Reserve. He arrives with 29 other ranks as replacements. 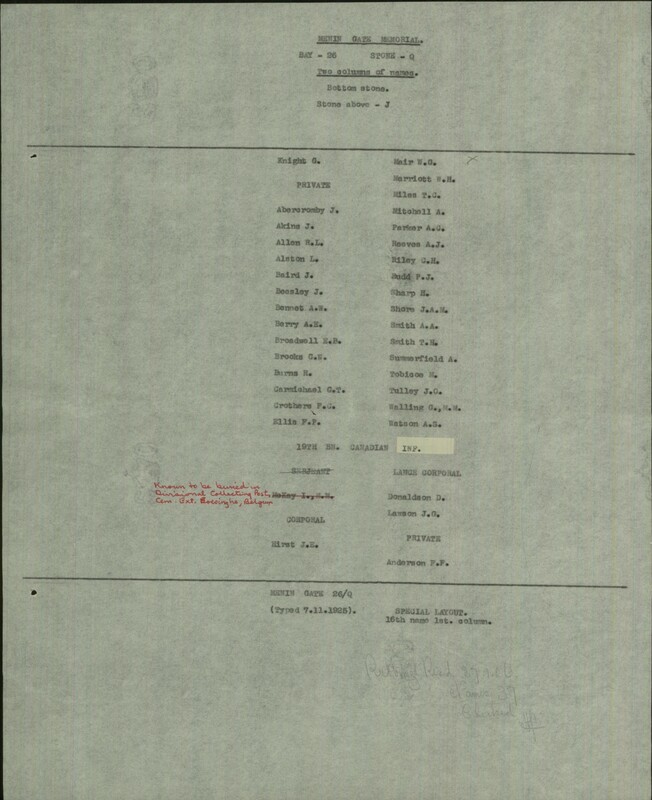 June 12, 1917 Appointed Lance-Corporal Appointed Lance-Corporal as Tanner, H.J. reg. no. 195222 promoted. November 21, 1917 Killed in Action Circumstances of Death Card: Killed by concussion from a shell.